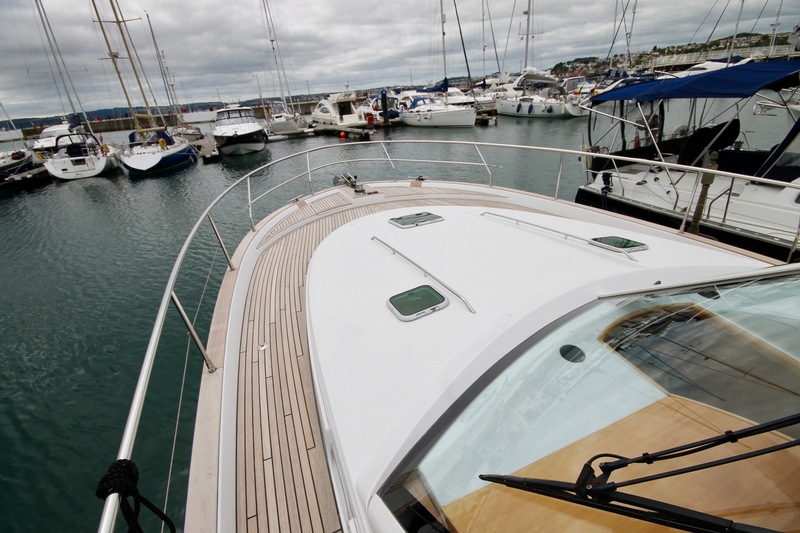 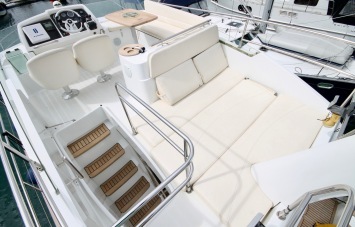 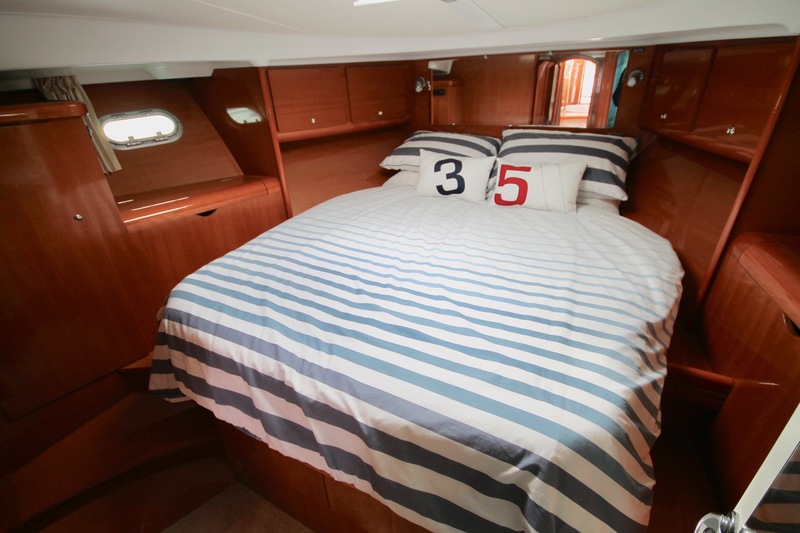 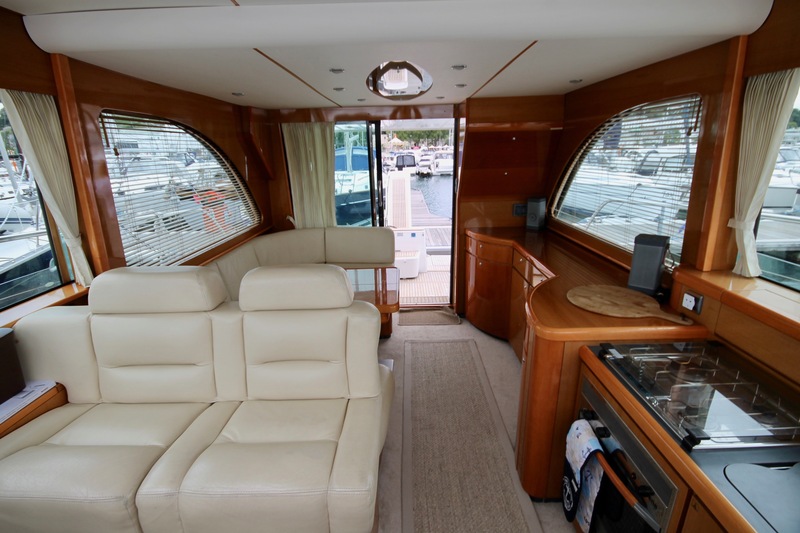 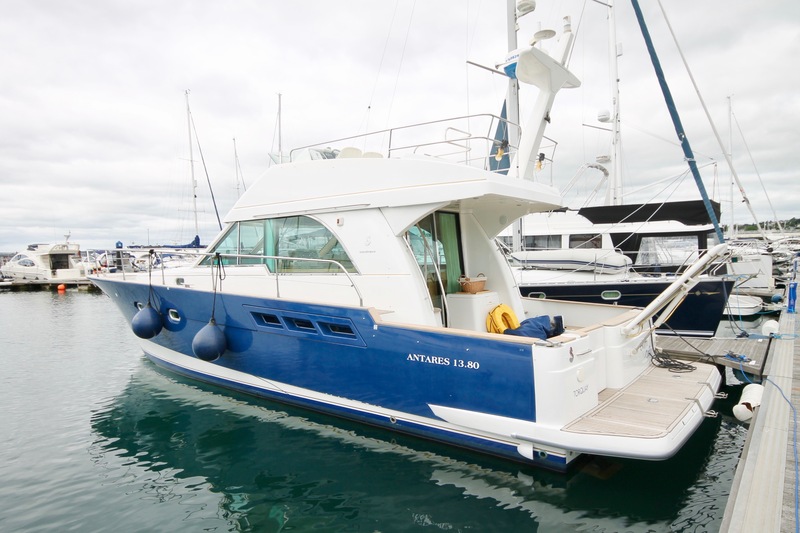 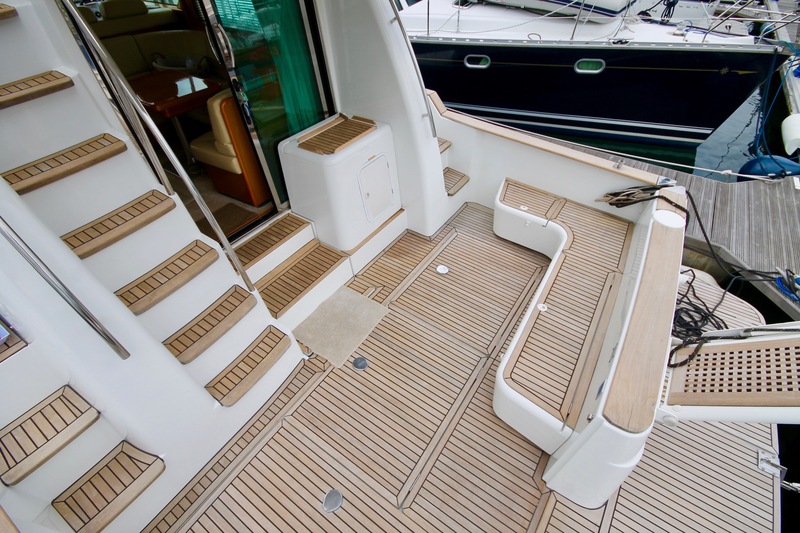 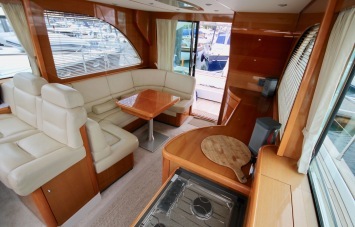 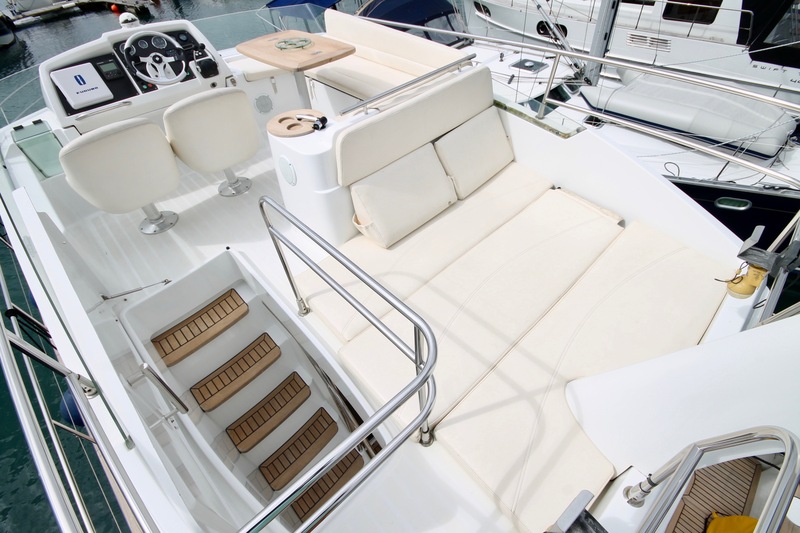 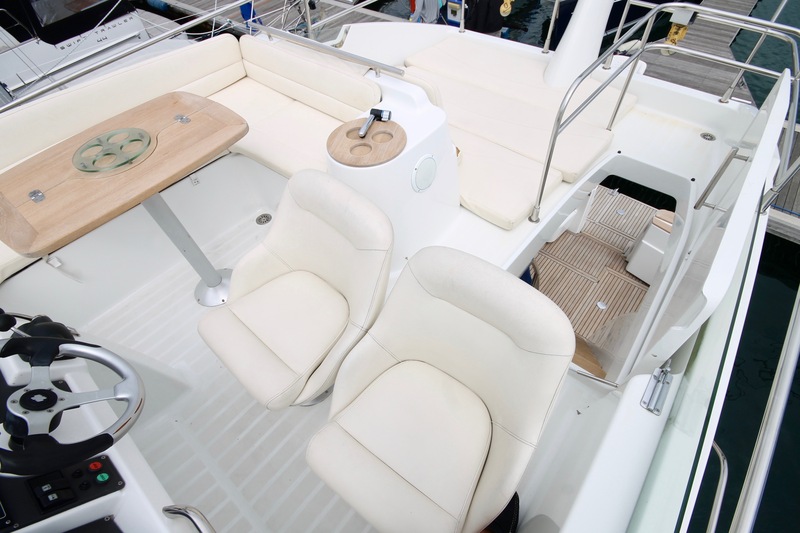 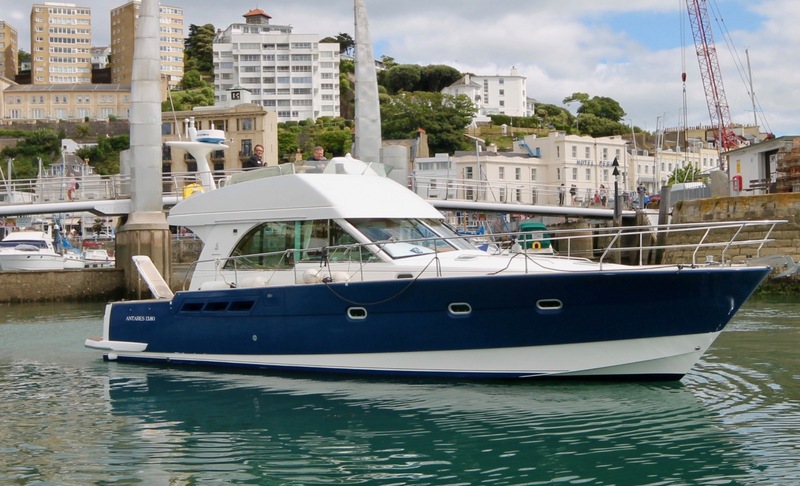 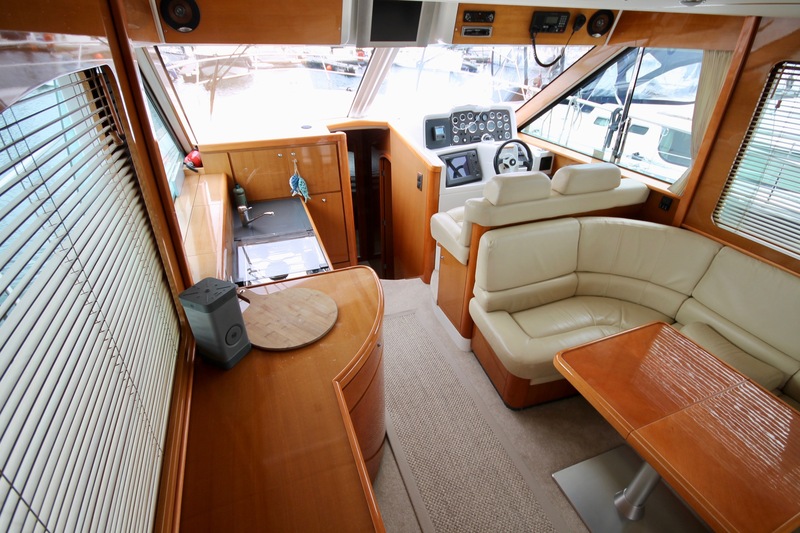 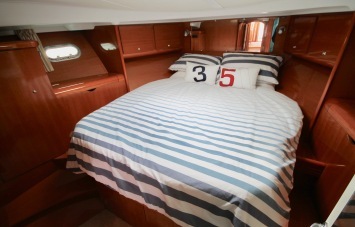 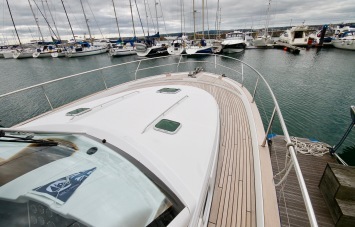 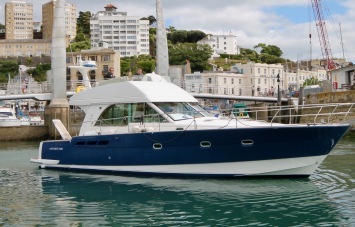 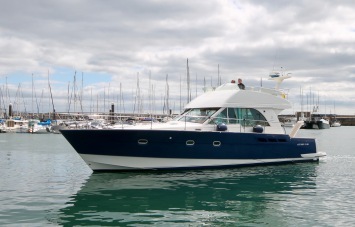 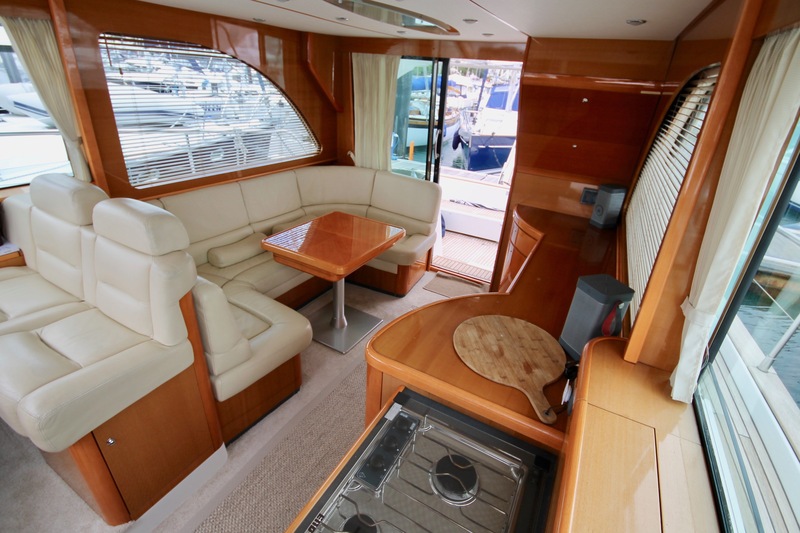 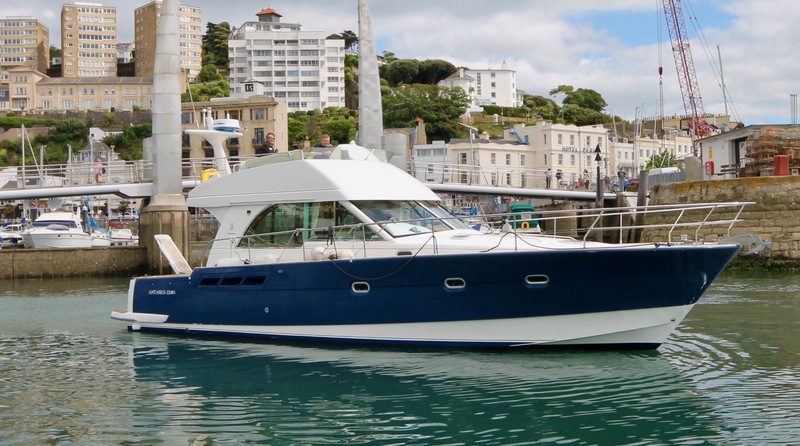 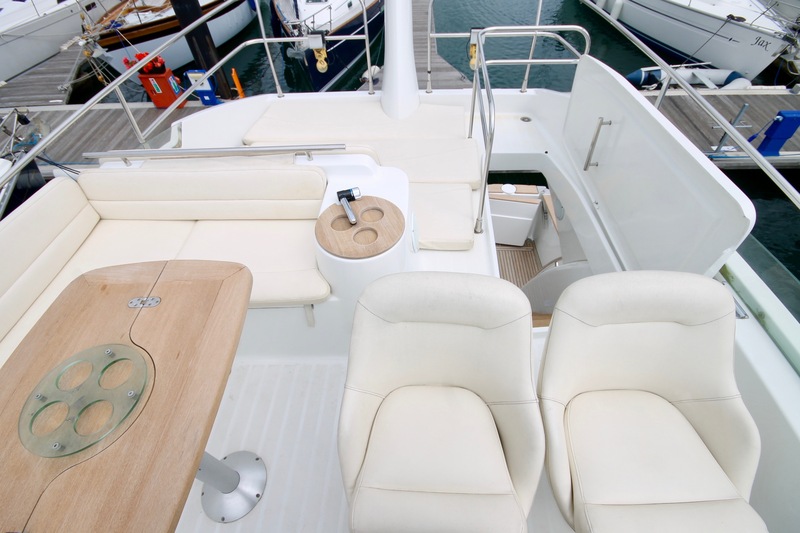 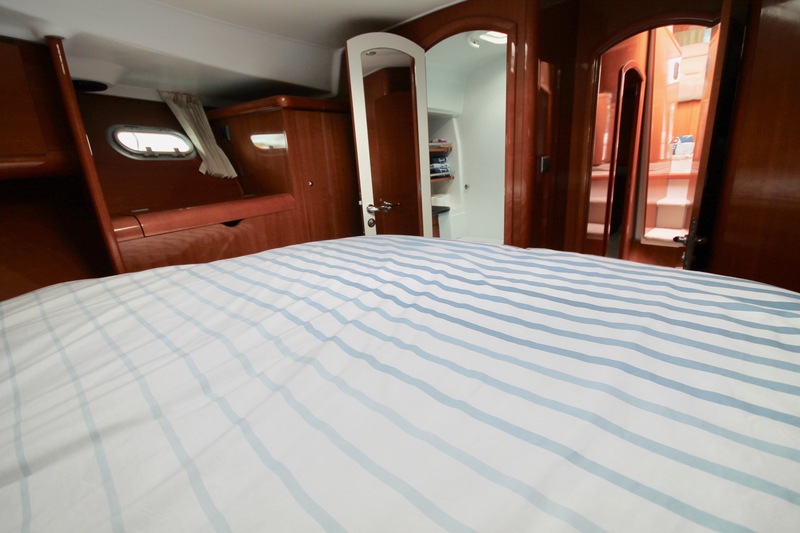 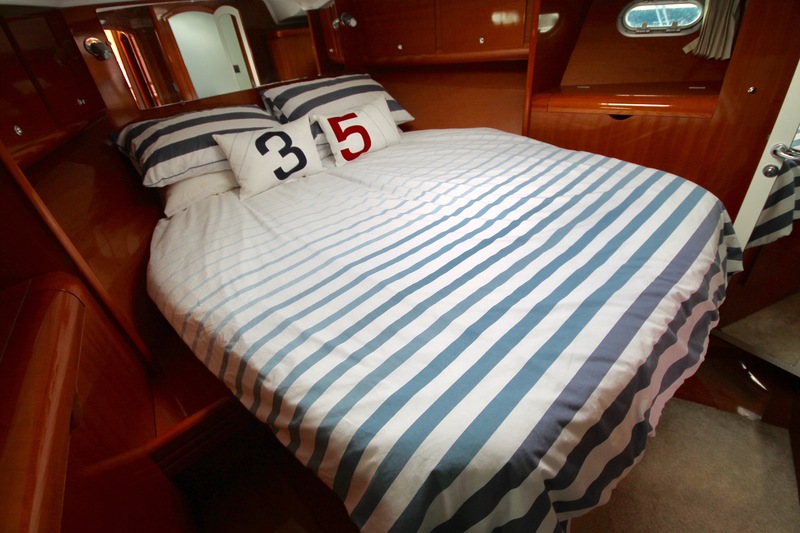 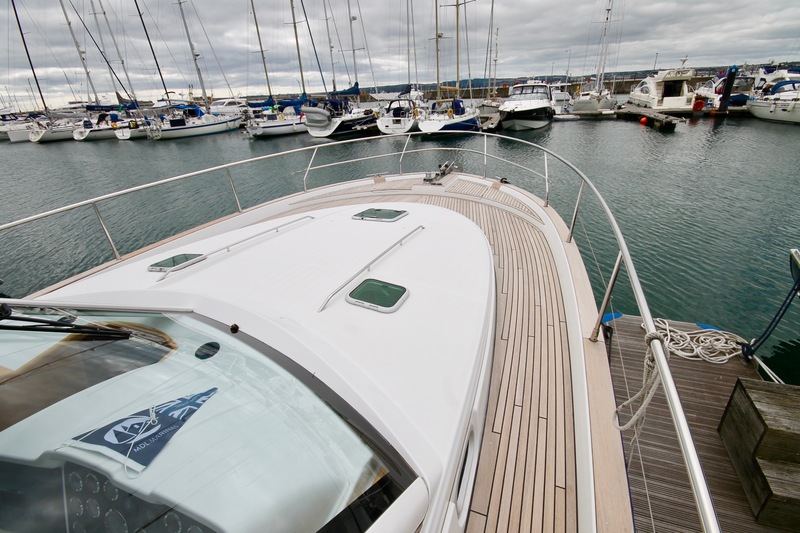 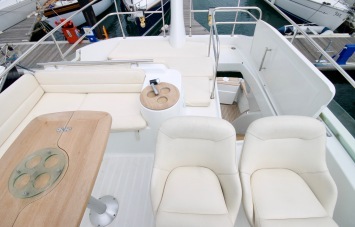 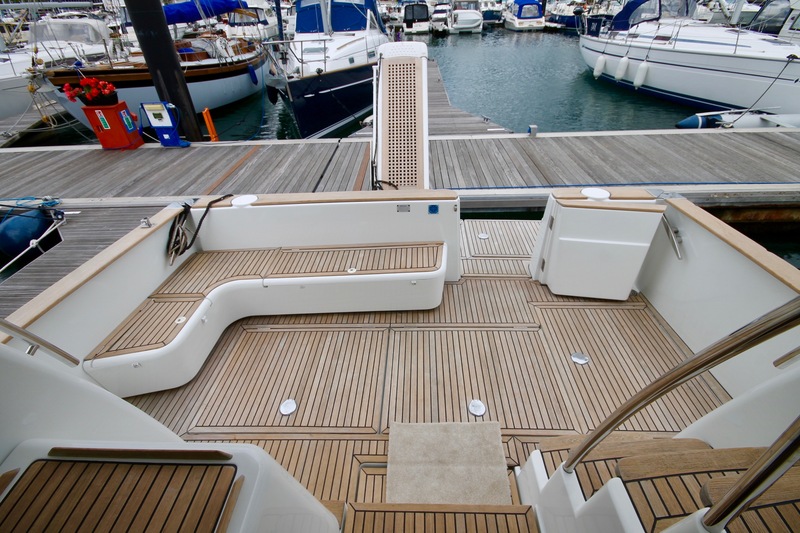 The Beneteau Antares 13.80 offers excellent sea keeping abilities, trawler yacht styling and unusually for a vessel of this size, 3 cabins and 2 heads. 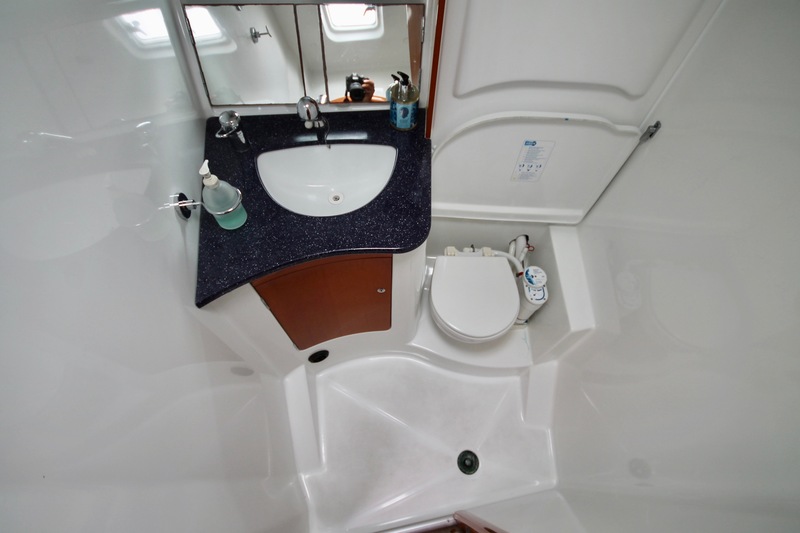 Each head compartment is placed between the cabins, ensuring maximum privacy and comfort. 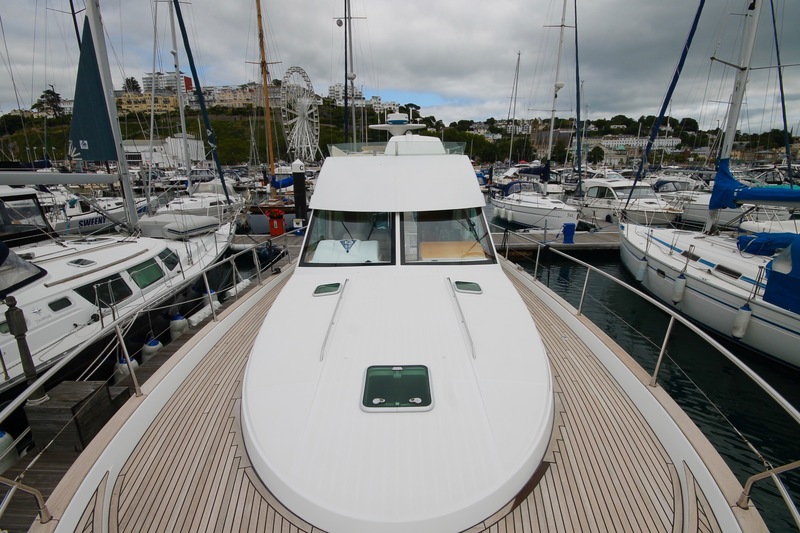 With 2 engines on shafts, plus a Bow thruster this is a very easy boat to handle and manoeuvre, wide side decks, high solid guard-rails add to the safety for crew. 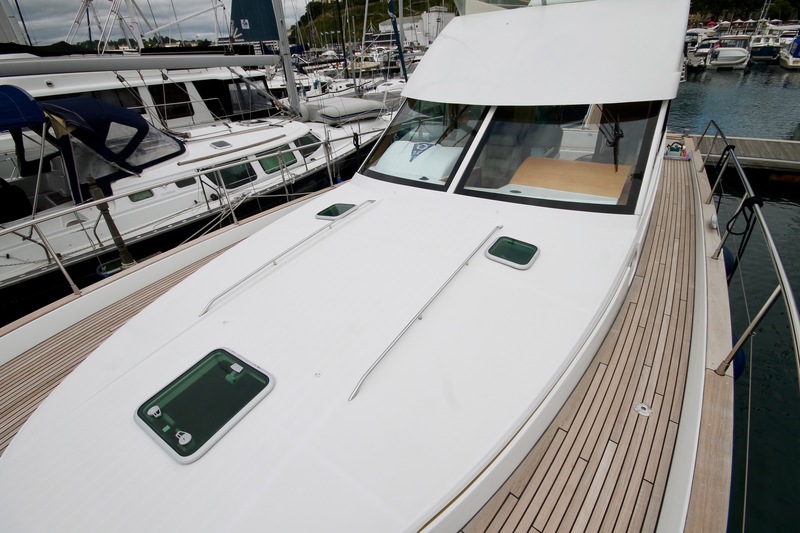 Recently this boat has had all antifoul removed, then recoated, both engines and generator serviced, full polish and teak treatment. 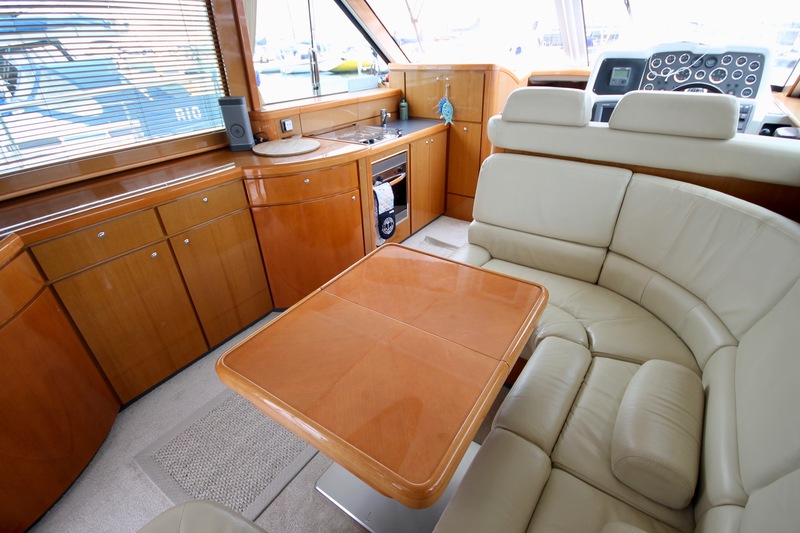 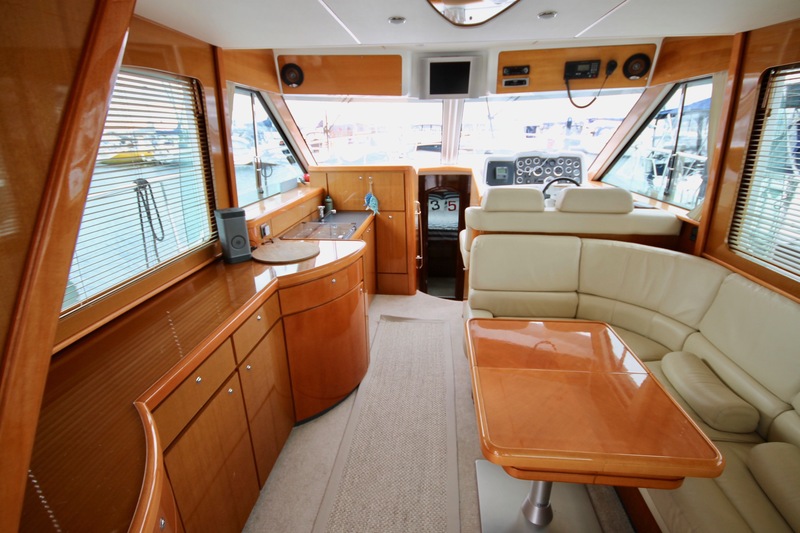 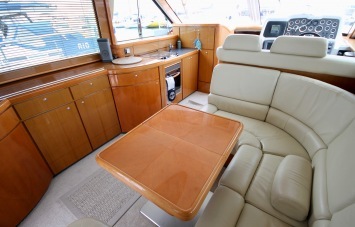 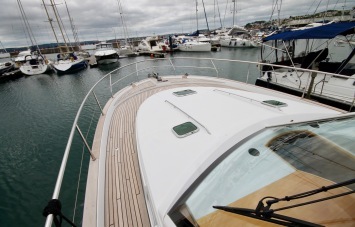 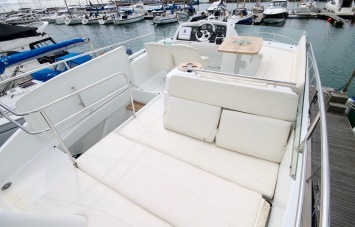 This boat looks as good as it does in the photos and we do not expect it to remain on the market for long. Please contact us to make an appointment to view. 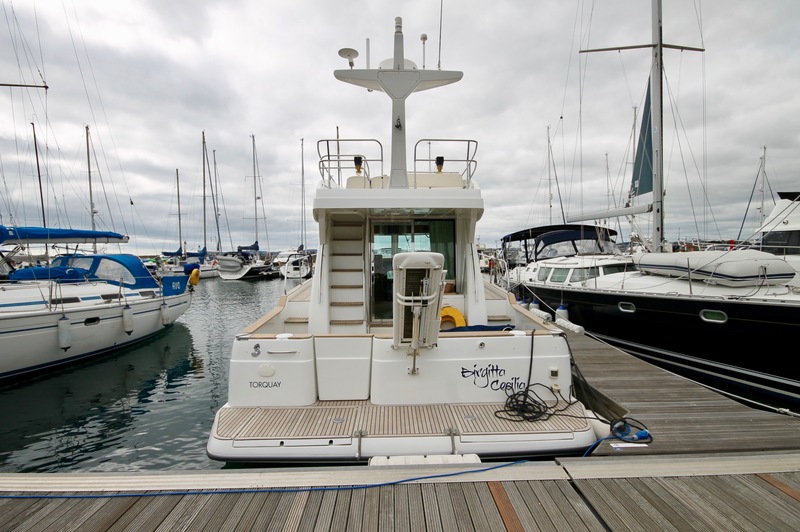 90 kg bow thruster with controls at lower and upper helm positions. 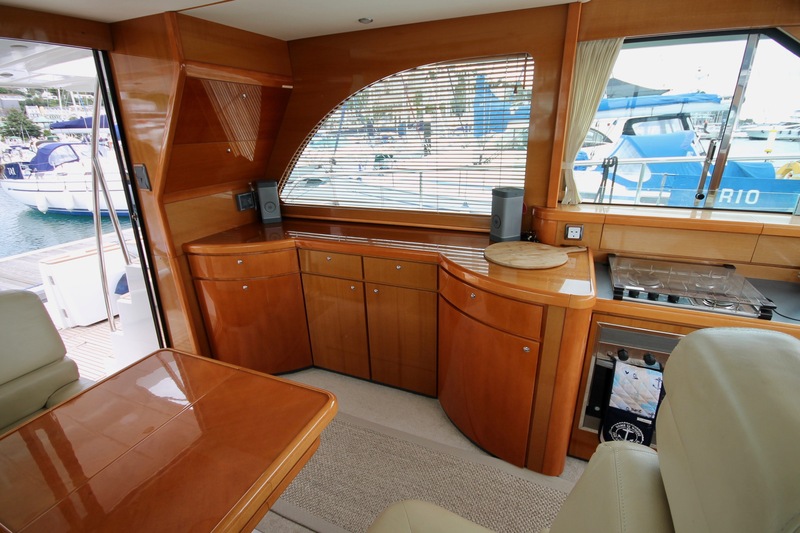 Onan 4kva diesel generator (2008). 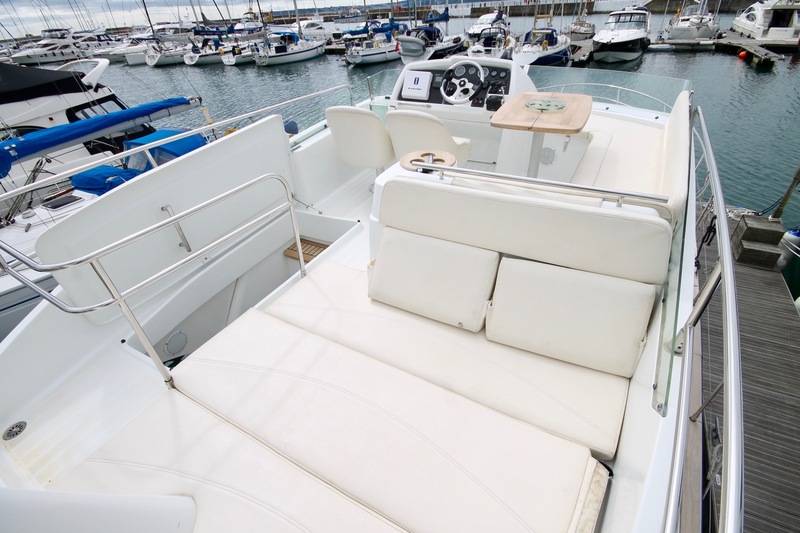 12 volt system – 4 x 12v batteries (2 x engine start and 2 x services) charged by main engine mounted alternators 12v lighting throughout inc engine room lighting. Std navigation lights. Spotlight and 12v horn on radar support. 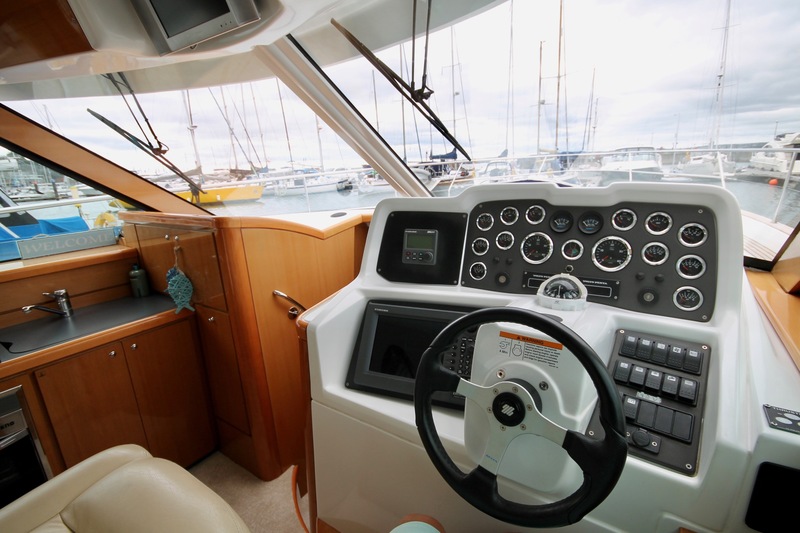 Windscreen wipers to lower helm position. 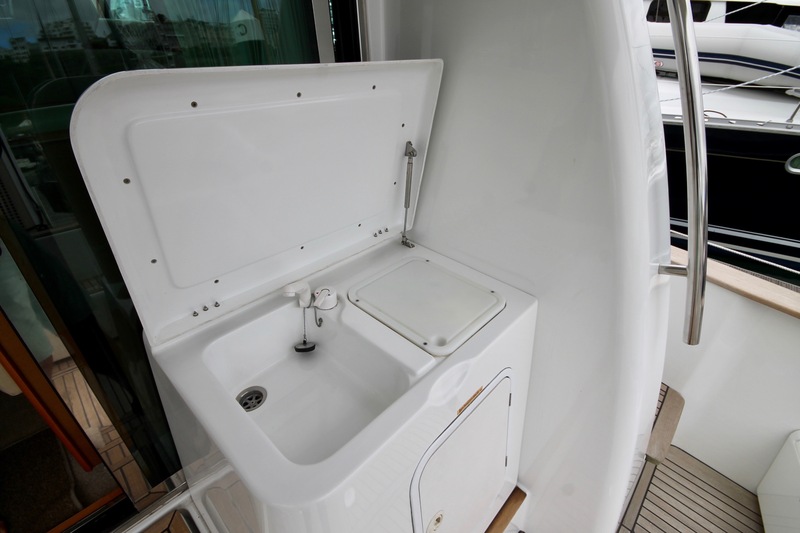 240 volt system – 40 amp battery charger through shore power system with outlets below and immersion heater in calorifier tank. 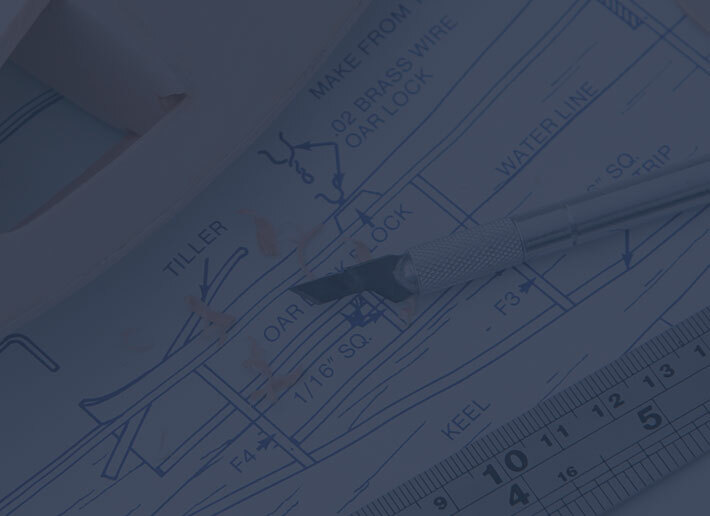 240v Generator. Furuno Navnet M1833C combined radar GPS plotter. 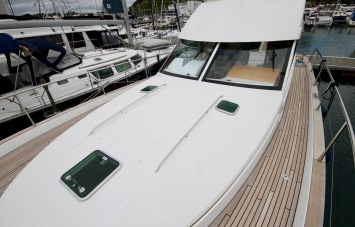 Second hand set for Icom VHF. Six berths in three cabins plus saloon. 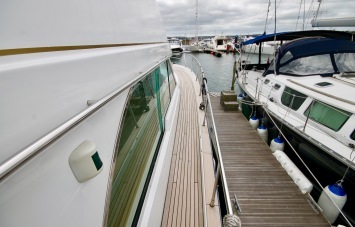 Two heads. 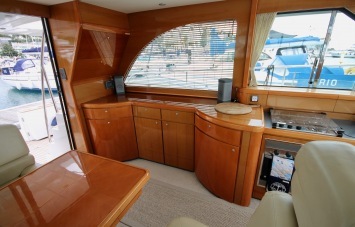 Stereo radio/CD with saloon and cockpit speakers. 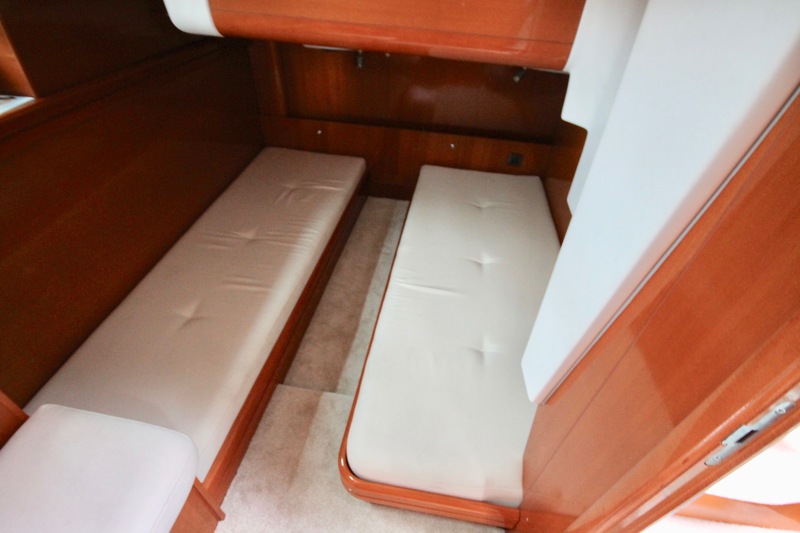 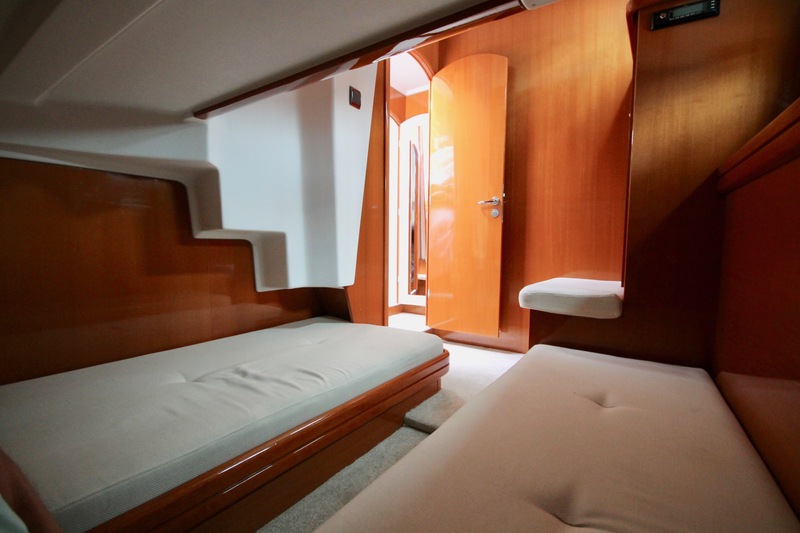 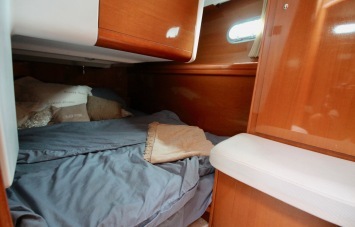 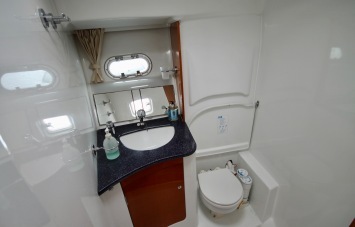 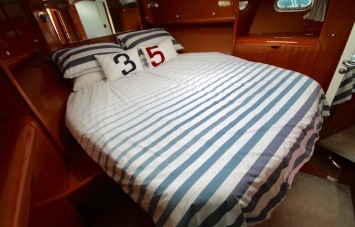 Large master cabin fwd with centreline double berth, plenty of stowage and hanging lockers. 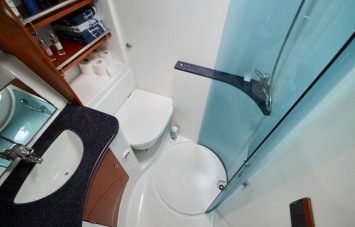 En-suite head with electric toilet piped to 80l holding tank (new 2012), wash basin, and shower. 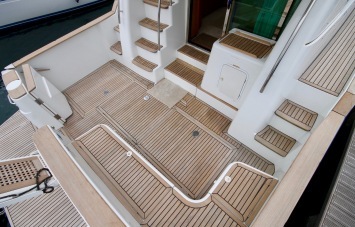 From forward lobby, steps up to saloon / wheelhouse. 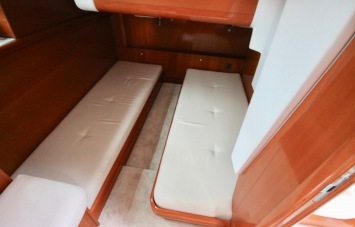 U shaped dinette settee to starboard with extending and lowering saloon table to convert to occasional double berth. 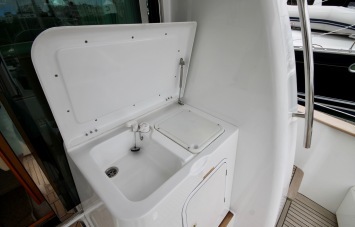 Galley to port with 80 litre front opening 12v fridge, 2 x s/steel sinks, gas hob, separate gas oven with grill, microwave oven, Sideboard aft to port. 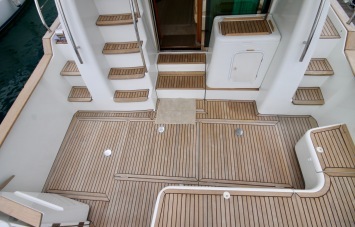 Double sliding rear doors out to large cockpit. Second head to port with electric toilet, wash basin and shower. Double cabin to port with hanging locker. 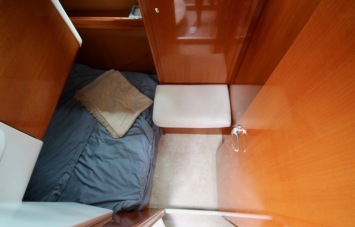 Two berth cabin to starboard with hanging locker and storage shelf. Large aft cockpit with teak laid sole. 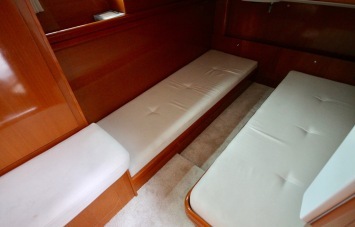 L shaped bench seat with storage under. 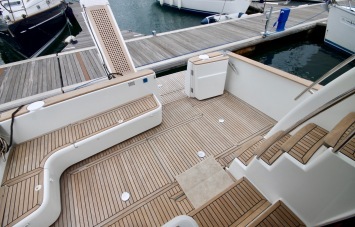 Gate in transom with access to large teak laid bathing platform with swim ladder. GRP ?stairs? to flybridge with teak treads. 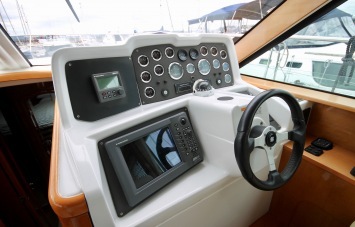 Helm station with repeater instruments and engine controls. Helm and co-pilot swivelling seats. 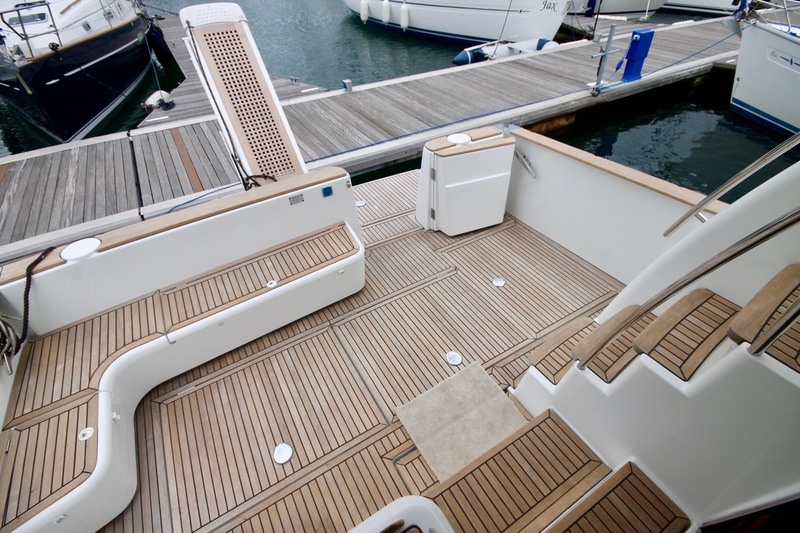 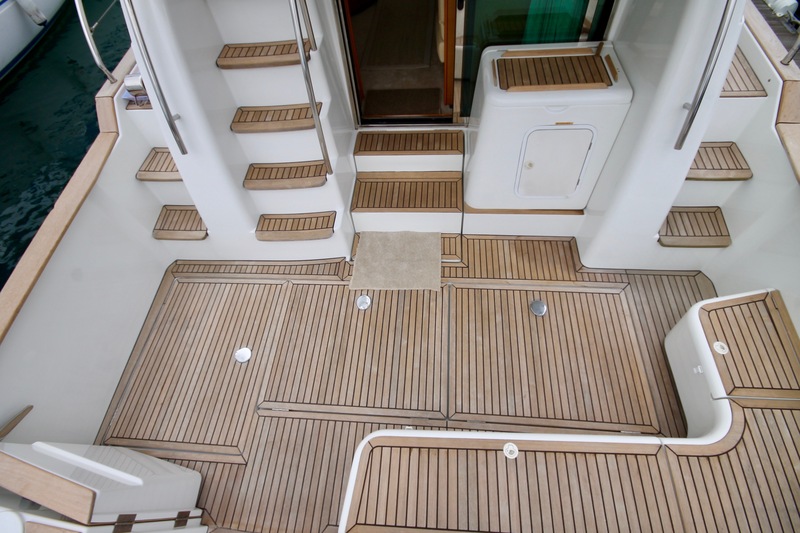 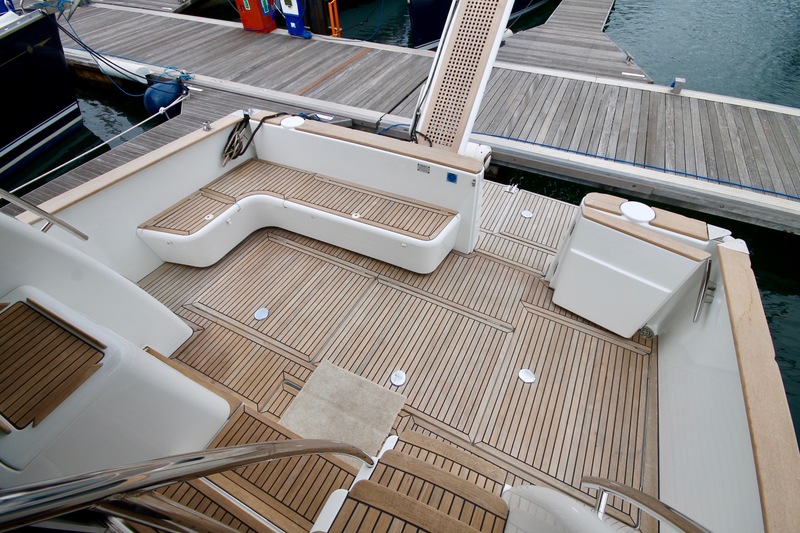 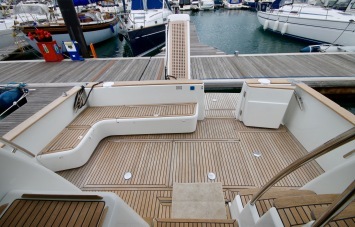 Wide teak laid side decks with s/s rail reaching back to cockpit. 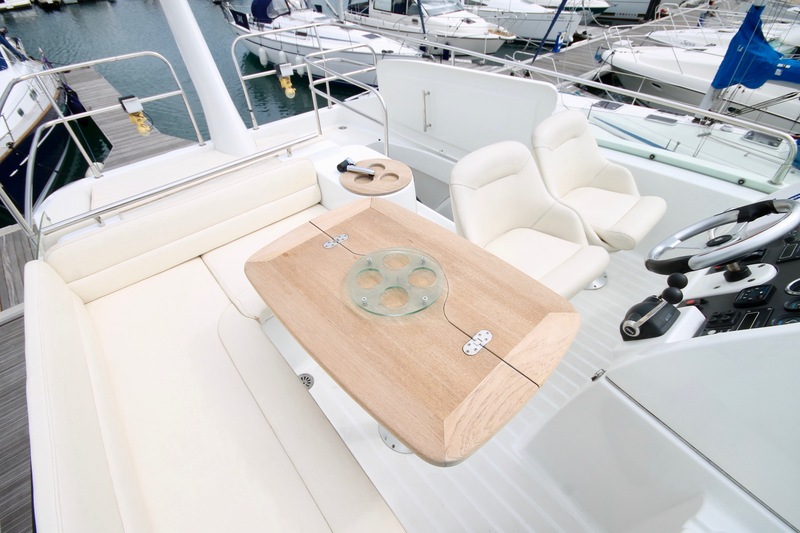 1,500w electric anchor winch with anchor and chain ? 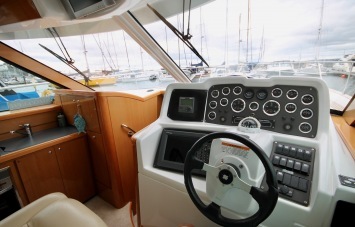 deck & helm controls. 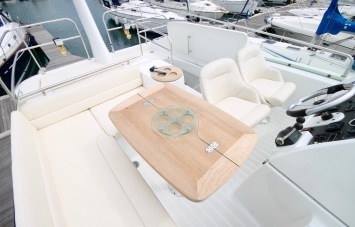 Bow, stern and midships mooring cleats. Auto and manually operated electric bilge pumps. 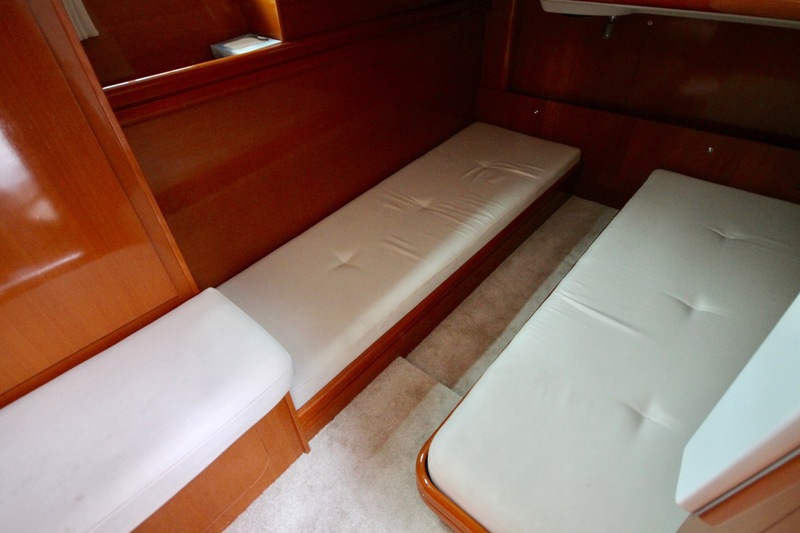 Fire extinguishers (not guaranteed in date). 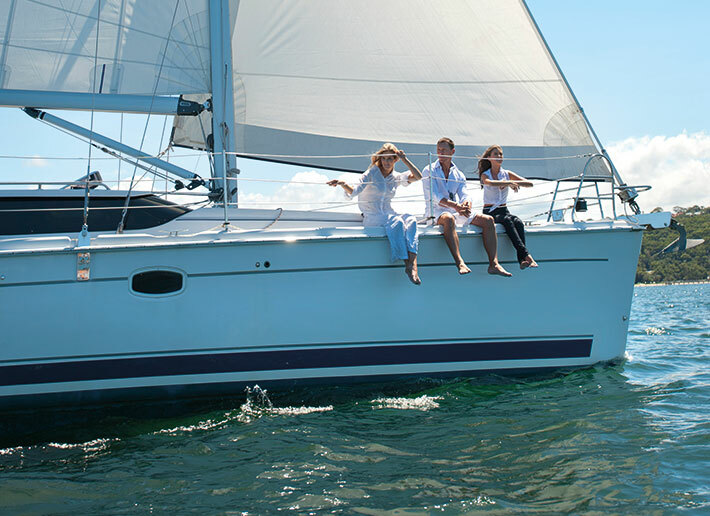 Norfolk Broads Safety Certificate to 2020.